fark, I love that photo with the mop…if he is lusting that much over just an ordinary kitchen-aisle mop, what’s he gonna do when he sees the enjo? oh Thirdy – I laughed! but really, Lewis sounds like she might be Bettina Aren’ts cousin or something. You mean this is not a SAD photo but a pensive gazing at the mop with love photo? I read that article and scoffed as well, Helen because I remember using those very same stats for my book (WLB for Dummies). I often comment to Love Chunks that because he’s the house-chef he gets all the lavish praise from his two girls (Sapph and myself) and our friends at dinner parties, but *no-one* opens up their drawers, sees the clean undies there and gushes, “Oh WOW Kath, this is faaaabulous” do they? Oh and the mop guy? He’s soooo about to go in for the wet, open-mouthed snog…. Maybe mop guy has been dating stick thin models and has just made a mistake. 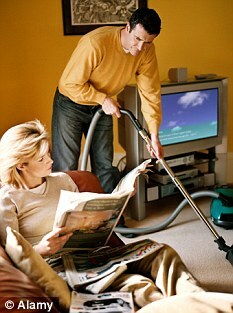 I love the hard done by look on the guy vacuuming while the woman reads the paper. Of course the implication being that she’s been there all day, while he’s been hard at work. You know I think that my poor partner bears the brunt of my frustration over this issue. I often realise that I don’t express appreciation over his contributions to the household work because I fear making it seem special or heroic. There must be a balanced approach somewhere. I like how you included “the planning and remembering” parts — I don’t have a male partner, but I have had male roommates for many years and I so often have had to play “mother/organizer/delegator” to them. Since they’re roommates, I can force them into taking an equal share of the chores, but since they’re dudes, they can’t possibly remember to clean their dishes until I remind them. Ripper headline, Helen!! and well noted content. 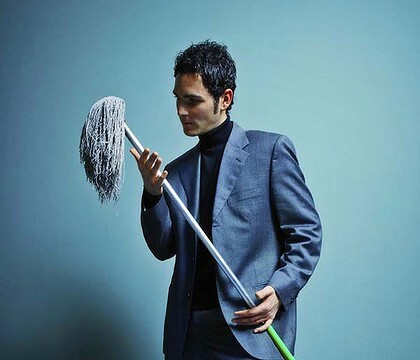 I have sidestepped most of this for many years by hiring cleaners at various points – once it was a male and female team. And of course they were awfully efficient because it was their (hic) job. Still want my three husbands for the gardening work though. Ah, very timely piece for me, thank you, as I have in the last weeks had words with LOML about taking more responsibility for doing his washing, shopping, cooking, cleaning as it became apparent I would be left to do it all. It’s not so much the doing of such things that is burdensome, it’s being the only one who is thinking that such things need doing. That second photograph, of the helot toiling under the gaze of a forbidding and indolent domainatrix, a fearful emmanation of the “Castrating Mother”, was something else again to behold. Why is he not sitting down watching football, while the blond, cutely made up, serves him a cup of tea? As for the first photograph, surely unrequited love. No sensitivity from you folk at all, is there? All those grocery bags carted miles into the giant carpark to the four wheel drive, and who has to carry them, six steps behind Gloriana? Do they not have shopping trolleys where you live, Paul? Fortunately, they have women, too. Of course the set would look better if the photos were right way up.